Fake Beatles No. 10: Tomorrow Never Knows, Do One? Los Shakers: "Espero Que Les Guste 042" The title of this track from 1966's Shakers for You LP translates to "I hope you like it 042" (and no, they probably don't know what the 042 refers to, either). As for the Fabuloso Cuatro de Uruguay, i've been gathering Fake Beatles for about 30 years, and Los Shakers are, hands down, the greatest synthesizers of both the early Fabs and the later psychedelic era. Surely done with a tenth of the time and budget expended on the original, "Espero," thanks to Los Shakers' Spanish-accented English lyrics, comes off as just as lyrically obtuse as those mystical insights John Lennon cribbed from a book whilst tripping. Matthew Sweet: Lost My Mind From 1995's 100% Fun album, this bit of neo-psych musing from this pop prince has all the requisite trippy trappings. That includes lyrics such as "We follow the same sound / Standing on the ground," which would mean less than nothing if you've never had a Love Special Delivery from Alice Dee and didn't spend your £sd to acquire a London Social Degree. Squire: No Time Tomorrow This '80s mod revival band, as befitting the resurrected '60s genre, worshiped all things Who and Small Faces. Yet leader Anthony Meynell also displayed a serious Beatles hankering, with songs veering from the "Please Please Me" rewrite of "The Face of Youth Today" to 1982's "No Time Tomorrow," on which his phased vocals and droning guitars and McCartneyesque bass line justifies the tipoff word "tomorrow" in the title of this tune that doles out about 25 percent to the "Taxman" as well. Extra points for the Beethoven's Ninth intro; points deducted for introducing too much melody (and a bridge) into the track. The Rutles: Joe Public Of course, Neil Innes had to introduce a little Ron Nasty-ness into the mix. "Joe Public" is an Innes solo composition that he Rutle-ized for 1996's Archaeology comeback album. A lovely and lovingly rendered addition to the Pre-Fab Four canon, the song's lyrics are of a soicopolitical instead of metaphysical bent. More funny-peculiar than funny-ha-ha, "Joe Public" carries on the Rutles' winning streak and marks Innes' completion of every Beatles archetype. The Chemical Brothers: Setting Sun and The Chemical Brothers: Let Forever Be If you held a Revolver to their temples, this electronic music duo would be forced to admit to owing their entire existence to "Tomorrow Never Knows." Therefore, it's unsurprising that they have turned off their minds, relaxed and floated downstream on two separate musical occasions. It also surprises no one that they employed the vocal assistance of one Noel Gallagher, a man who surely knows a thing or two about faking the Fab. "Setting Sun," from 1996, got them sued by Apple, who mistakenly accused the Chem Bros. of sampling the original. How did they celebrate their victory? By going at it again with 1999's "Let Forever Be," once again using the Oasis leader to season their song. Have you considered "Strawberry Road" by Sam Phillips off the "Martinis and Bikinis" album? Also a lot of early Michael Penn is extremely Beatleicious. Then there is, of course, the entire Apples in Stereo oeuvre. Don't forget The Three O'Clock's "As Real As Real." Good call on the Three O'Clock number -- it definitely has a variation of the "TNK" drum pattern, and Michael Quercio's Lennon-sucking-helium-and-singing-through-a-rotating-housefan voice clinches it. OK, here's my two cents: Hilly Fields (1892) by Nick Nicely. 80s psych never sounded so good again, or since. Really any song on the at-long-last-released Psychotropia CD, but that was the big single. I'd point to 49 Cigars (perhaps even more than Hilly Fields) and 6B Obergine too, and not just because they all have numbers in the name. Much of The Olivia Tremor Control's Dusk At Cubist Castle elpee. Your point on the Chemical Brothers exceedingly well taken. And perhaps The Private Psychedelic Reel off Dig Your Own Hole as well? Does anyone recall Todd Rundgren's Utopia and the album "Deface the Music"? The entire album consists of well-executed "knock-offs" of assorted Beatles tracks. 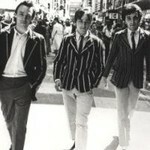 The first track, "I Just Want To Touch You", sounds like a cross between "She Loves You" and "I Wanna Hold Your Hand". You can spend the whole album trying to figure out what songs are being "tributed". I guess this falls under coincidence, unless Matthew Sweet is not his real name. In Liverpool, there was a club called The Cavern which featured The Beatles in their early days. Its address is on Mathew Street. Taxman, that is a coincidence, but what isn't is a fact regarding someone else i referred to in this post. Noel Gallagher named his band after the Oasis Club in Manchester, the locus of that city's beat group scene, and a venue in which the Beatles themselves performed, natch. How about "The King Is Half Undressed" by Jellyfish (on the "Bellybutton" album)? A Texas trio called Cotton Mather, really tapped into their inner-Scouse with the album, Kon Tiki; particularly the songs, "Autumn's Birds" and Aurora Bori Alice". The Chemicals are definitely influenced by "Tomorrow Never Knows" and took that sound to "Setting Sun" and to "Let Forever Be", but Noel Gallagher wasn't employed to assist, it was the other way around. Gallagher wrote and played those songs and Rowland/Simons produced and mixed. Without Noel, those songs don't exist. The "don't like the Beatles" delusion reminds me of when I used to read the excessively nerdy MI rock fanzine Blitz! in the '70s/early 80s. The editor would go to great lengths to compare some New Wave band to a garage band that he and perhaps 3 others people had heard of, instead of making a direct reference to the Beatles (or others) who in reality had actually been the direct influence upon that '60s garage band. In other words, virtually none of the editor's cherished and thoroughly obscure pet faves would have existed if not for the Beatles (or Stones, etc.). And he had a fetish for calling bands like the Beatles "overrated," which is a total laugh (and a lie). One point of hilarity were the editor's cheerleading exercises in favor of the Monkees, but I always loved the TV show and the music, even moreso now. Monkees for the Rock Hall! How could you not like the Beatles? That would be like saying you don't like oxygen. Without either, survival is a definite no.